If your child is overweight, it's important to help him start to return to a normal weight as soon as possible. It's unwise to impose drastic changes as this will likely cause stress and conflict and can be harmful to your child's health. Implementing sensible, familywide changes can be the most effective way to help your child lose weight. Eating as a family can help your child to understand portion control and the importance of a balanced diet. By choosing healthy foods to serve and setting your child's portion size, you can make sure he isn't regularly overeating or choosing unhealthy foods. Healthy family meals include roast dinners, shepherd's pie, salmon mornay, barbecues, stir-fries and kebabs. School lunches should be made up of healthy, satisfying foods. Sandwiches with some meat and vegetables will give your child a good bump of protein, carbohydrates and fiber, which will help keep her feeling full and energized through the afternoon. A piece of fruit will give her something sweet to enjoy as well as a vitamin fix without a large dose of calories. Good fruit options include apples, oranges, melon, grapes, strawberries, pears and plums. Many children's downfall is in the snack cupboard. If your child has ready access to candy, chips, snack bars, dried fruit and other snack foods, she may be significantly overeating on a daily basis. Even if she has unlimited access to fruit, bread or healthier options, the calories can still add up. Frequent snacking needs to be curbed to one or two healthy options per day -- veggie sticks, small servings of cheese and crackers, fruit, yogurt or the occasional granola bar should take precedence. A sedentary lifestyle can lead to weight gain in children. Too much time in front of the television, computer, tablet and game console means that they are burning off very little energy compared to their more active counterparts. 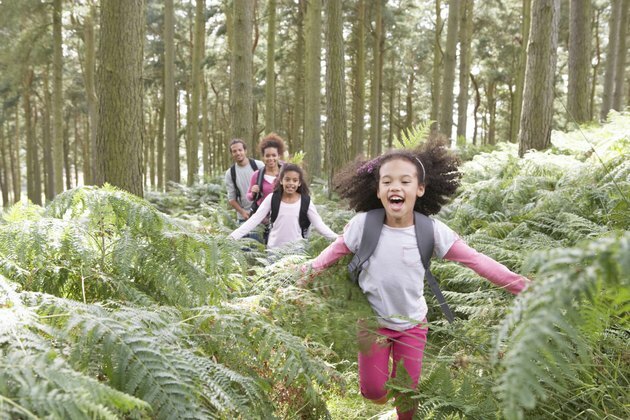 According to the Centers for Disease Control and Prevention, children need at least an hour of activity every day. Each week should include some aerobic activity like running or cycling, some muscle strengthening activity such as gymnastics or body-weight movements and some bone-strengthening activity like stop-start sports or jumping rope. Doing these activities as a family will help your child feel comfortable with the process and enjoy it, rather than feeling as though it's a punishment or that he is being singled out. How Can a 12 Year Old Lose 10 Pounds?